"friday-lunch-club": "This is not simply a vote for Assad. It is a vote for ceasefire." "This is not simply a vote for Assad. It is a vote for ceasefire." "when I went to cover the Syrian voting in Beirut I was startled by the crowds and enthusiasm. People I spoke to said they wanted to go home, and Assad was the road. It was a desolate choice, but the enthusiasm seemed genuine. Assad has won the election with 88.7%, the lowest for a Syrian president in recent history. But less than Sisi's 96%. The turnout was 73%, which means over ten million voted for Assad. If fireworks and gunfire in Beirut is a measure of things, this is more than a palace rigging. More enthusiasm in Syria than Egypt. 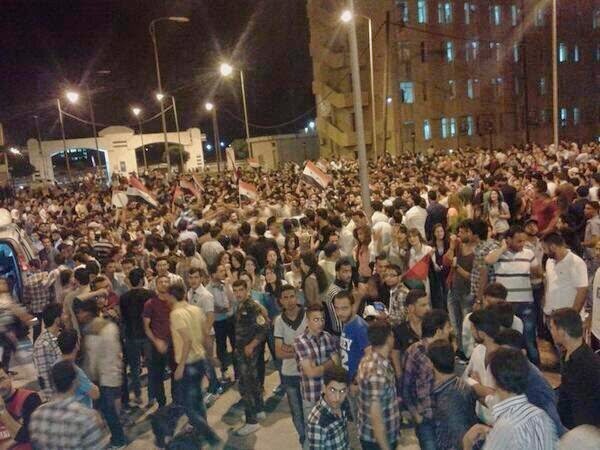 Damascus, Latakia and Homs (pic) have people on streets, celebrating. This is not simply a vote for Assad. It is a vote for ceasefire."